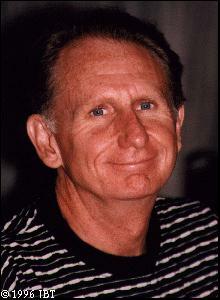 René Murat Auberjonois was born on June 1, 1940, in New York City. René was born into an already artistic family, which included his grandfather, a well-known Swiss painter, and his father Fernand, a writer. The Auberjonois family moved to Paris shortly after World War II, and it was there that René made an important career decision at the age of six. When his school put on a musical performance for the parents, little René was given the honor of conducting his classmates in a rendition of Do You Know the Muffin Man? When the performance was over, René took a bow, and, knowing that he was not the real conductor, imagined that he had been acting. He decided then and there that he wanted to be an actor. After leaving Paris, the Auberjonois family moved into an Artist’s Colony in upstate New York. At an early age, René was surrounded by musicians, composers, and actors. Among his neighbors were Helen Hayes, Burgess Meredith and John Houseman, who would later become an important mentor. Houseman gave René his first theater job at the age of 16, as an apprentice at a theater in Stratford, Connecticut. René would later teach at Juilliard under Houseman. René attended Carnegie-Mellon University and studied theater completely, learning not only about acting but also about the entire process of producing a play. After graduating from CMU, René acted with various theater companies, including San Francisco’s American Conservatory Theater and Los Angeles’ Mark Taper Forum. In 1969, he won a role in his first Broadway musical, Coco (with Katharine Hepburn), for which he won a Tony. Since then, René has acted in a variety of theater productions, films, and television presentations, including rather famous stints as Clayton Endicott III on the comedy series Benson and Constable Odo on Star Trek: Deep Space Nine. Here on René’s Page, you can find more information on René’s film & television career. as well as his dramatic readings for audiobooks and video games. Thanks to Lisa Wilcox at ORACLE, you can look at a relatively complete list of René’s theater credits. Even with his full schedule as an actor, René still has time for his family and his interests outside acting. He and his wife, Judith, have two children, Tessa and Remy-Luc, who are both pursuing careers in the performing arts. Besides acting, René is an accomplished gourmet cook, an artist, and a photographer. He is also a vocal supporter of various charitable organizations, such as Doctors Without Borders (Médecins Sans Frontières). He regularly donates the proceeds from the sale of autographed items to such organizations. 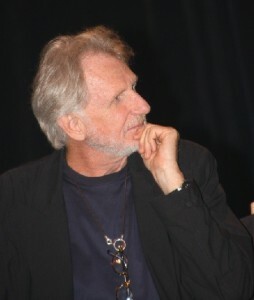 Since DS9 ended in 1999, René has kept busy as a guest star on numerous television series (including The Practice, Judging Amy, Enterprise, and Frasier), and as a regular on ABC’s TV series Boston Legal as Paul Lewiston, colleague and nemesis to Alan Shore (James Spader) and Denny Crane (William Shatner) (2004-2008). He continues to take on acting roles in films (such as Certain Women, directed by Kelly Reichardt) and on theatre stages in Los Angeles and New York. He performed as Jethro Crouch in a Broadway production of Sly Fox, which earned him an Outer Circle Critics Award nomination for “Best Featured Actor in a Play” and, in summer 2008, he earned rave reviews in the title role of The Imaginary Invalid at The Shakespeare Theatre in Washington, DC. Some of his recent TV guest roles include appearances on Bored to Death, Criminal Minds, Grey’s Anatomy, and The Good Wife, and the recurring characters of “Hugo Miller” on Warehouse 13 and “Walter Nowak” on Madame Secretary. His voice work can be heard on cartoon series such as Looney Tunes, Pound Puppies,and Archer and in video games such as Fallout: New Vegas.